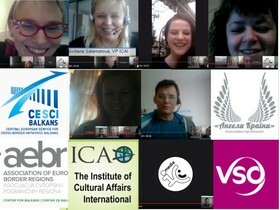 CESCI Balkans and AEBR Network of Young Leaders for Cross-border Cooperation (YLCBC) in partnership with Global Online Dialogue organised two online workshops on the topic "Youth Power for Positive Transformation" that was held on 8th and 15th March 2016. The First Workshop searched for answers to the following questions: What is Peace for you? What is Conflict for you? What can Youth do for peace preservation and conflicts prevention? What skills should youth need for positive transformation in the field of peace and conflict prevention? What is the Real Power of Youth in influencing on Peace Preservation and Conflicts Prevention? The Second Workshop searched for answers to the questions such as Youth for Economic Development vs/and Environmental Protection? What can Youth do for Sustainable Development? What skills should Youth need for positive transformation in the field of Sustainable Development? What is the Real Power of Youth in achieving Social, Economic and Territorial Cohesion? The Workshops sought the answers from three points of view: What can Youth do for Youth? ; What can Youth do for Society? ; and What can Society do for Youth?.